Three Activities To Challenge And Strengthen Students’ Scientific Method Techniques. 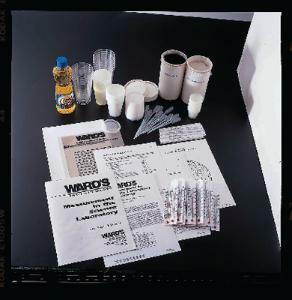 Students compare time, temperature, and volume by observing the effects of heat on light and dark-colored sand; familiarize themselves with volume, mass, and density by calculating and comparing the densities of oil and water; and use estimation and averaging skills to determine the total number of simulated bacterial colonies. The kit includes enough materials for ten setups, teacher’s guide, and student copy masters. Materials Needed but Not Required: Light sources, scales, and graduated cylinders.